Toddler Recipes: Festive Pretzels: Decorate to suit the Occasion Or Holiday! Toddler Recipes: Festive Pretzels Perfect for Any Occasion! 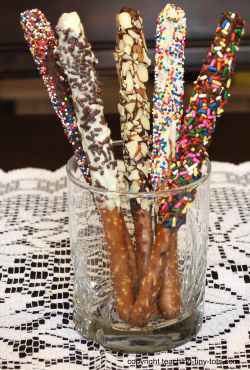 Pretzels dipped in white chocolate or semi sweet chocolate and rolled in your favorite topping make a tasty treat that can be displayed in a small vase or container, tied with a bow or packaged in a treat bag. Adjust this toddler recipe to suit any occasion, holiday or party! Melt chocolate in microwave safe container. Since microwaves vary, times will vary. Heat until just melted. Chocolate should be warm not hot. Chocolate scorches very easily and will taste burnt if heated too long. Microwave 30 seconds, stir 15 secs, and repeat as needed. Dip pretzel into chocolate or brush chocolate evenly with silicone pastry brush. Sprinkle toppings on pretzel over bowl for a lighter coating or line a pan with parchment paper or foil and pour sprinkles onto it. Roll until pretzel is evenly coated. Let dry on waxed paper. Cool in refrigerator for 30 min to harden faster. We found it easier to use the silicone brush or the back of a wooden spoon to apply the chocolate. Nuts are easiest to coat by rolling dipped pretzel into it. Pour nuts onto either parchment paper or foil. 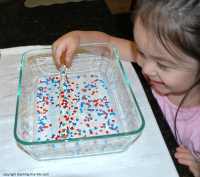 If your child is heavy on the sprinkles...use a piece of foil to work on. Fold in half to form a crease and when your child is done sprinkling you can pour into a container to sprinkle the next pretzel. These can be prepared ahead of time and refrigerated until use. Perfect for a picnic or party! 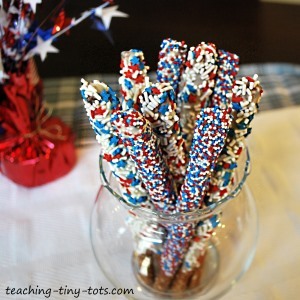 Pretzels are dipped or brushed in white chocolate and rolled in red, white and blue sprinkles. Arrange in a small vase for a party centerpiece, or package a few in a clear cello bag and tie with a bow. Perfect for a gift to teachers, and other people you want to express your gratitude. 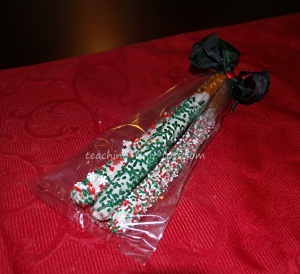 Pretzels are dipped in various Christmas colored sprinkles. 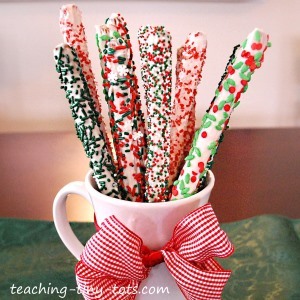 Another yummy idea is using peppermint pieces. Arrange in a cup, small vase, or package a few in a clear treat bag and tie with a bow. This toddler recipe is definitely an eyecatcher!